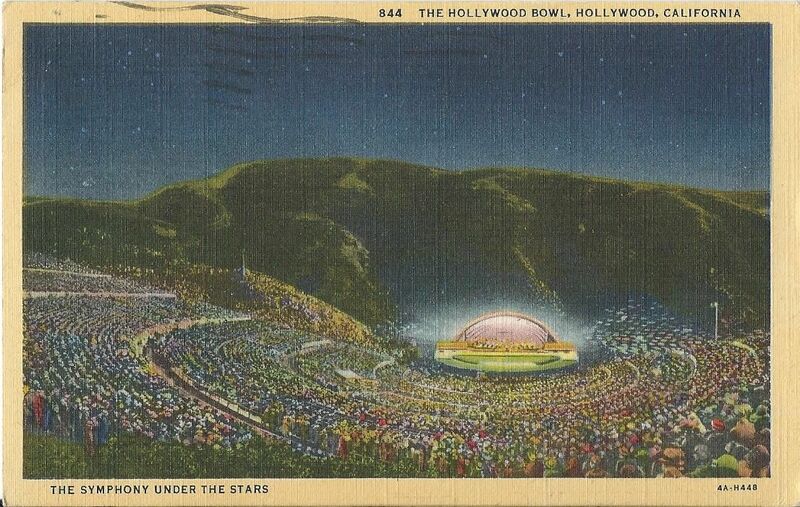 In the summer of 1946, the Hollywood Bowl was celebrating its Silver Jubilee and its first full peacetime season of “Symphonies Under the Stars” since the the war. Radio announcers Ken Carpenter and Jack Haley served as masters of ceremony. Actor Robert Montgomery provided narration. Leopold Stokowsi, Igor Stravinsky and Sigmund Romberg shared orchestral duties for the classical portion of the program. Then, after an intermission, things got swinging. 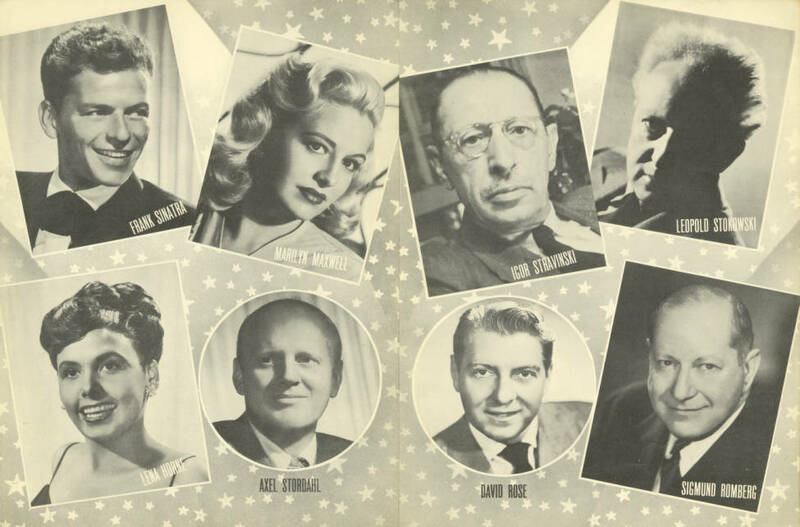 Accompanied by an orchestra made up of movie and radio studio musicians, there were performances by Lena Horn, Frank Sinatra, and Marilyn Maxwell. Bob Burns appeared with his “All Star Band” (Lawrence Welk, accordion; Freddy Martin, sax; Billy Butterfield, trumpet; Charlie Barnet, sax; Carmen Cavallaro, piano; Phil Harris, drums; Harry James, trumpet). Bob Hope, Dorothy Lamour, Bing Crosby and Eddie Rio did one of their routines. Though not in the official program, according to notes in the margin of the author’s copy, Lucille Ball and Danny Thomas also took part. Mickey Rooney, who’d been discharged from the Army on March 6, narrated the climax of the evening, a huge percussion extravaganza called “The Evolution of the Drums” arranged by Al Armer. Wounded soldiers, sailors and marines recuperating in hospitals around the US could tune in via the Armed Forces Radio Service’s “bedside network.” The concert raised enough funds to provide many more month’s worth of entertainment. As of June, 1947, more than 500 concerts, from a 1-man band playing an accordion to 60-piece orchestras, had been performed around Southern California Army and Navy hospitals. 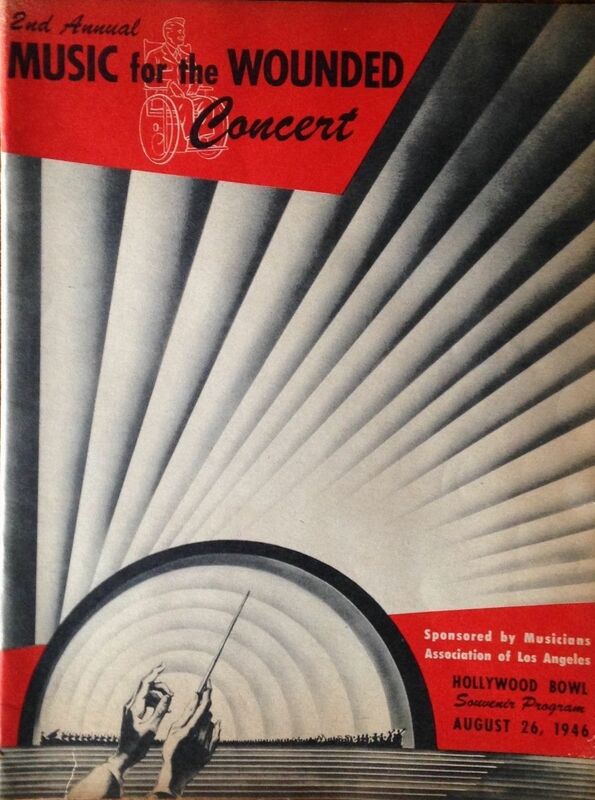 A third Music for the Wounded show was held at the Bowl on July 2, 1947. One of the area hospitals to benefit from the Music for the wounded concert was Birmingham Veterans Administration hospital in Van Nuys. 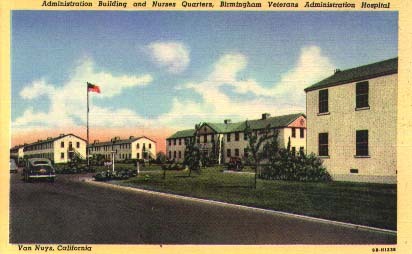 Built in 1943 to serve as both a general and debarkation hospital, it was turned over to the VA on March 31, 1946. It can be seen in the film noir Backfire, filmed in 1948 and released in 1950, the year the hospital closed. California Military Museum. Great article – new news for me! !